Jeff Neumann is no stranger to canoes. He got his first taste of paddling as a 10-year-old boy, in Quincy, Ill. That’s where he and a cousin lashed two canoes together and spent idyllic days floating in protected waters along the Mississippi River. As a teenager it was weekends on the Pere Marquette and White rivers in Michigan. The Neumann family had relocated to Grand Rapids. When the work week was over they piled into the car and headed north to paddle those rivers. 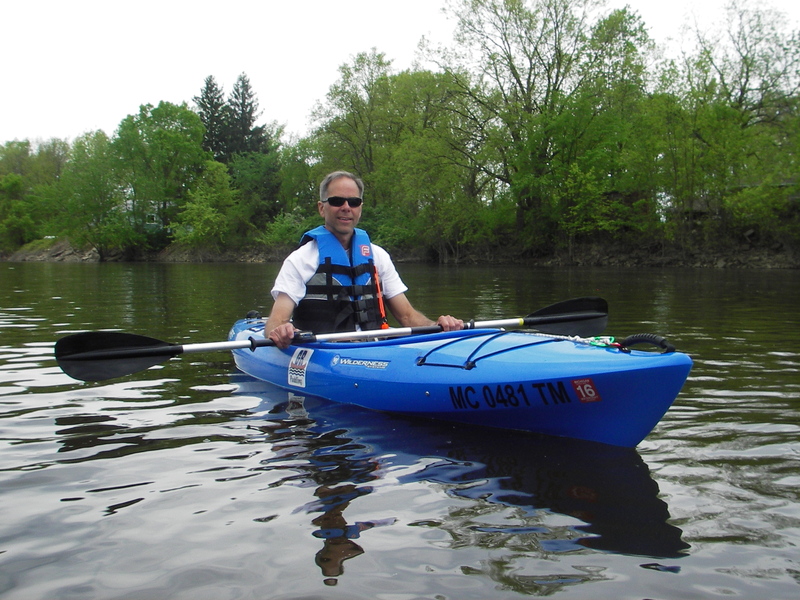 Today, at 53, Neumann still loves the allure of a quiet paddle, the natural scenery along rivers in Michigan. So much so, the former Grand Rapids Community College electronics instructor launched a guided canoe and kayak business upon retiring from teaching. “We paddled all the time,” said Neumann, a tall, lanky man who exudes a youthful enthusiasm for canoeing and kayaking. Rita Neumann, Jeff’s wife and a physical therapist, is the paddling company’s business manager. Their son, Mark Neumann, a theatrical lighting designer and event coordinator, is the technical guy behind their website. GR Paddling LLC is different from most canoe livery services where people are shuttled to a river, dropped off and picked up downstream. not allowed, but paddlers are encouraged to bring binoculars and watch birds or take in the natural scenery and environment. The company offers guided trips down a number streams like the Grand, Coldwater, Flat, Thornapple and Rogue rivers along with a variety of area lakes. 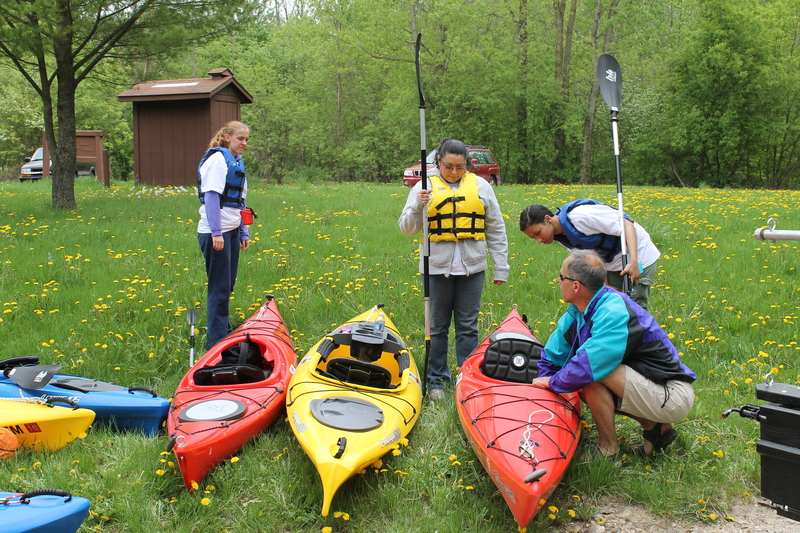 It provides door to door pickup and drop-off services, canoes, kayaks, paddles, lifejackets and some basic instruction. Neumann, an American Canoe Association certified instructor, accompanies his clients on their trip, offering tips along the way and showing them where to go. Just recently he paddled with a couple from Florida. They had flown into Grand Rapids for a quick vacation with two young children. They found Neumann’s unique paddling service on Experience GR, the city of Grand Rapids’ website. He picked them up at their hotel and took them down an eight-mile segment of the Grand River between Lowell and Ada, a scenic paddle that many never get to enjoy. “She was scared to death; they were from out-of-town,” Neumann said. “She asked about alligators. They never would have done this by themselves (through a livery). Some people need a little TLC. Neumann’s business caters to inexperienced paddlers, people who otherwise might never get out and try canoeing or kayaking, or those who need a little assistance. He sees potential in the travel market, out-of-town visitors who can order up a trip to fit their schedule and get picked up at the hotel and dropped off later without much fuss. ‘We are looking to work with tourists in town and companies who want to do team building and people who want to get out and experience these things for the first time,” Neumann said. If you’ve got family or friends in town visiting and want to show them a good time, or business associates with tight schedules that enjoy the outdoors, GR Paddling might be just the ticket. Jeff Neumann will certainly be enthusiastic about getting them on the water and back home safely. This entry was posted in Uncategorized and tagged Adventure Travel, Apostle Islands, Beaver Island, Canoeing, Coldwater River, Flat River, GR Paddling LLC, Grand River, Jeff Neumann, Kayaking, Paddling, Pictured Rocks National Lakeshore, Thornapple River, Uncommon Adventure. Bookmark the permalink.